I received my Ph.D. student from Reykjavik University in Iceland in december 2012. The thesis project was carried out under the supervision of Dr. Ymir Vigfusson at Reykjavik University in Iceland and Dr. Mads Dam at KTH in Stockholm, Sweden. The thesis subject is broadly security properties of distributed systems, in particular distributed aggregation networks and their applications. Currently sr. software engineer at the startup company OZ in Iceland, working on the design of scalable conent delivery systems. Research interests: Computer- and network security, distributed systems and algorithms, ad-hoc networks, cryptographic algorithms, scalable content delivery methods. 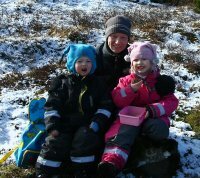 I live in Reykjavik with my wife, Fjóla, professor at the University of Iceland, and my two children, Vala Rún and Jón Valur. My shedule does unfortunately not allow much time for extracurricular activities, but I do enjoy photograpy, bicycling, karate and music. Some of my photography work can be found at photo.net. MSc student co-supervision spring 2010. Abu Hamed Mohammad Misbah Uddin. Graduated june 2010 from University of Tartu/KTH. Member of Skýrslutæknifélagið (Icelandic Society for Information Processing). Security group board member since fall 2011. Rannís Student Innovation Fund Grant (NSN), summer 2010. Rannís Technical Development Fund Pilot Project Grant #101513010, 2010. Top three student paper award at Sensor Applications Symposium (SAS) 2012. Student travel grant Sensor Applications Symposium (SAS) 2012. Student travel grant IEEE International Conference on Communications (ICC) 2012.